While deploying docker containers for immutable infrastructure on AWS ElasticBeanstalk, I’ve learned a number of useful tricks that go beyond the official Amazon documentation. This series of posts are an attempt to summarize some of the useful bits that may benefit others facing the same challenges. Each AWS account needs to have your ElasticBeanstalk application defined initially. Operationally, there are few reasons to remove an application from an AWS account, so there’s a good bet it’s already there. You should really only ever have to do this once per AWS account. There is an example of this in the Makefile as the make application target. Step 2 : Update your AWS development environment. During our initial VPC creation, we used the aws command from the awscli python package. When deploying ElasticBeanstalk applications, we use the eb command from the awsebcli python package. Alert: An update to this CLI is available. There really should be an awsebcli Docker image, but there presently is not. Add that to the list of images to build. aws ec2 import-key-pair --key-name myapp-dev --public-key-material "$(cat ~/.ssh/myapp-dev.pub)"
The downside to the second method is that AWS has the private key (as they generated it, and you shipped it via https over the network to your local machine), whereas in the first example they do not. This ssh key can be used to access AWS instances directly. After creating this ssh key, it is probably a good idea that you add it to your team’s password management tool (Keepass, Hashicorp Vault, Trousseau, Ansible Vault, Chef Encrypted Databags, LastPass, 1Password, Dashlane, etc) so that the private key isn’t only on your development workstation in your local user account. Note the naming convention of ~/.ssh/$(PROJECT)-$(ENVIRONMENT) - this is the default key filename that eb ssh will use. So long as you see 4 or fewer keys, including they key you created above, you should be ok. If you have more than 4 keys listed in your ssh-agent keychain, depending on the order they are tried by your ssh client, that may exceed the default number of ssh key retries allowed on the remote sshd server side, which will prevent you from connecting. Now we should have an ssh key pair defined in AWS that we can use when spinning up instances. The --profile aws-dev is optional, if you created profiles in your ~/.aws/config file. If you are using AWS environment variables your your ACCESS/SECRET keys, or only one default AWS account, you may omit that. The application must exist in AWS first, which is why this is run after the previous step of creating the Application in AWS. Any field appearing as null will likely need some manual attention from you after the next step. Previously, in Part 1 : Preparing a VPC for your ElasticBeanstalk environments, we generated a VPC using a CloudFormation with an output of the Subnets and Security Group. We will need those things below. Using eb create with full arguments for the various details of the environment. Using eb create with a --cfg argument of a previous eb config save to a YAML file in .elasticbeanstalk/saved_configs. We now have the above settings in a YAML file .elasticbeanstalk/saved_configs/myapp-dev-sc.cfg.yml which can be committed to our git project. The flip side of that is the YAML save config has static values embedded in it for a specific deployed VPC. Step 1 : Prepare your AWS development environment. If you haven’t already, prepare for AWS cli access. This will create a default configuration. I’ve yet to work with any company with only one AWS account though. You will likely find that you need to support managing multiple AWS configuration profiles. Getting in the habit of specifying --profile aws-dev is a bit of a reassurance that you’re provisioning resources into the correct AWS account, and not sullying AWS cloud resources between VPC environments. Deploying anything to AWS EC2 Classic instances these days is to continue down the path of legacy maintenance. For new ElasticBeanstalk deployments, a VPC should be used. The easiest/best way to deploy a VPC is to use a CloudFormation template. "ConstraintDescription" : "any alphabetic string (1-16) characters in length"
"ConstraintDescription" : "must be one of dev, qa, or prod"
"ConstraintDescription" : "must be a valid CIDR range of the form x.x.x.x/x." "ConstraintDescription" : "must be an IPv4 dotted quad plus slash plus network bit length in CIDR format"
watch --interval 10 "bash -c 'make events | head -25'"
You can run make watch to watch the CloudFormation events and wait for a CREATE_COMPLETE state. These CloudFormation Outputs list parameters that we will need to pass to the ElasticBeanstalk Environment creation during the next part of this walkthrough. As a general rule of thumb, each AWS ElasticBanstalk Application Environment should be given its own IAM Instance Profile to use. Each AWS EC2 instance should be allowed to assume an IAM role for an IAM instance profile that gives it access to the AWS cloud resources it must interface with. The JSON returned from that command allows an AWS library call with no credentials automatically obtain time-limited IAM STS credentials when run on AWS EC2 instances. This avoids having to embed “permanent” IAM access/secret keys as environment variables that may “leak” over time to parties that shouldn’t have access. Early on, we tried to do this as an ebextension in .ebextensions/00_iam.config, but this only works if the admin running the eb create has IAM permissions for the AWS account, and it appears impossible to change the launch InstanceProfile by defining option settings or overriding cloud resources in an ebextensions config file. Instead, the VPC above generates an InstanceProfile that can be referenced later. More on that later in Part 2. Today, I stumbled on the official CoreOS page on ECS. I’ve been putting off ECS for a while, it was time to give it a try. Make sure you have your AWS_ACCESS_KEY_ID and AWS_SECRET_ACCESS_KEY defined in your shell environment. This registers a ContainerInstance to the My-ECS-Cluster in region us-east-1. Note: this is using the EC2 instance’s instance profile IAM credentials. You will want to make sure you’ve assigned an instance profile with a Role that has “ecs:*” access. For this, you may want to take a look at the Amazon ECS Quickstart CloudFormation template. This ECS cluster is ready to use. Unfortunately, there is no scheduler here. ECS is a harness for orchestrating docker containers in a cluster as tasks. Where these tasks are allocated is left up to the AWS customer. What we really need is a scheduler. CoreOS has a form of a scheduler in fleet, but that is for fleet units of systemd services, and is not limited to docker containers as ECS is. Fleet’s scheduler is also currently a bit weak in that it schedules new units to the fleet machine with the fewest number of units. Kubernetes has a random scheduler, which is better in a couple ways, but does not fairly allocate the system resources. The best scheduler at present is Mesos, which takes into account resource sizing estimates and current utilization. Normally, Mesos uses Mesos Slaves to run work. Mesos can also use ECS as a backend instead. A Dockerfile both describes a Docker image as well as layers for the working directory, environment variables, ports, entrypoint commands, and other important interfaces. Test-Driven Design should drive a developer toward implementation details, not the other way around. A devops without tests is a sad devops indeed. Working toward a docker based development environment, my first thoughts were toward Serverspec by Gosuke Miayshita, as it is entirely framework agnostic. Gosuke gave an excellent presentation at ChefConf this year re-inforcing that Serverspec is not a chef centric tool, and works quite well in conjunction with other configuration management tools. Researching Serverspec and docker a bit more, Taichi Nakashima based his TDD of Dockerfile by RSpec on OS/X using ssh. With Docker 1.3 and later, there is a “docker exec” interactive docker API for allowing live sessions on processes spawned in the same process namespace as a running container, effectively allowing external access into a running docker container using only the docker API. PIETER JOOST VAN DE SANDE posted about using the docker-api to accomplish the goal of testing a Dockerfile. His work is based on the docker-api gem (github swipely/docker-api). Looking into the docker-api source, there is no support yet for docker 1.3’s exec API interface to run Serverspec tests against the contents of a running docker container. Attempting even the most basic docker API calls with docker-api, issue 202 made it apparent that TLS support for boot2docker would need to be addressed first. Next step: extend docker-api to support exec for serverspec based testing of actual docker image contents. Saturday’s project was installing OpenStack on a ChromeBox. Before you begin, make sure you know which ChromeOS device you have. In my case, it was a Samsung Series 3 Chromebox. Thankfully, the memory was very easy to upgrade to 16G, as the bottom snaps right off. We shouldn’t need this, but you never know. (And, yes, I did end up needing it during one of my iterations while writing this post). The switch in the image is how I put my ChromeBox into development mode. After flipping the switch, reboot. On this first reboot, the existing on-board storage will be wiped entirely, erasing any account credentials and cached content. Using cntl-alt-F2, enter the username “chronos” at the login: prompt. Hit return at the password: prompt (the default chronos password is an empty string). Note: You did not actually need to login to google via the UI interface. Now that you have a shell as chronos, you can enable USB booting. In order to install Ubuntu (or your distro of choice), we need to legacy boot. This requires a BIOS. 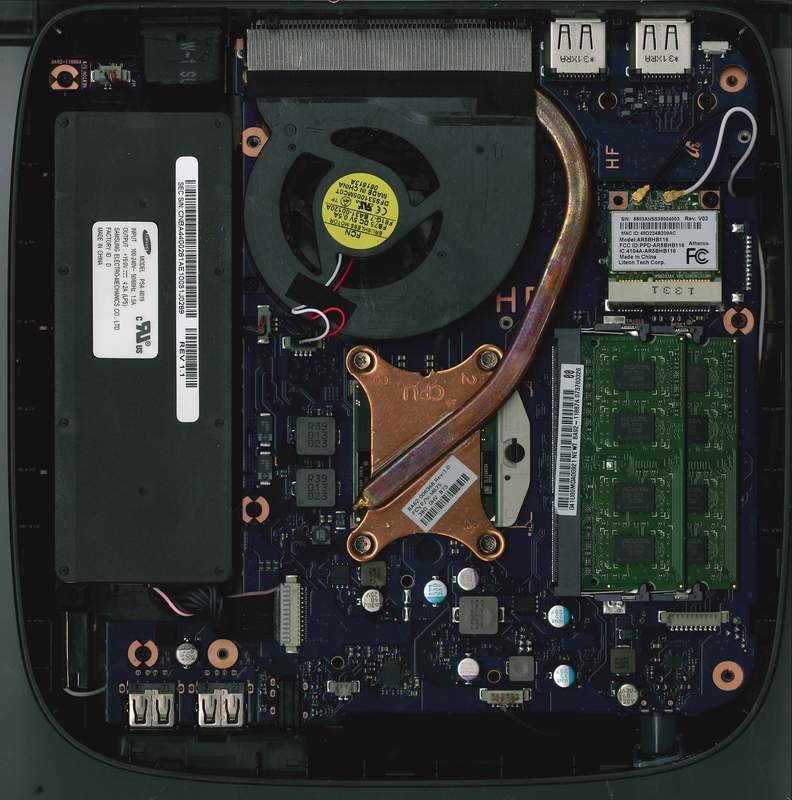 Newer ChromeBox hardware includes SeaBIOS natively. If you have an older ChromeBox (like the Samsung Series 3) that doesn’t have a SeaBIOS boot, you will need to flash one. Flashing a new bootstrap requires a jumper or other physical change to hardware to allow the flashrom tool to write to flash. A bit of folded tin-foil made for a quick jumper. The script makes you type “If this bricks my Chromebook/box, on my head be it!” to make sure you understand that you are most likely going to brick your chromebox/chromebook by proceeding. This is no joke. Being ok with potentially bricking my ChromeBox, I went ahead. The script ran to completion without errors, and was thoroughly successful. After rebooting, I now get a SeaBIOS splash identification (rather than the eventual sick computer). The downside to doing this is that I now must boot off of an external USB device, as the SeaBIOS doesn’t seem to support booting from the built-in MMC SSD anymore. I went ahead and pulled an Ubuntu Trust 14.04 ISO and DD’ed it to a USB stick on my Mac. After it finished flashing, I removed the USB stick from my Mac and plugged it into the front of the ChromeBox. The USB installation media for Ubuntu was detected by SeaBIOS as the second bootable USB device. I also attached 2 external 1TB USB disks to the back as the media that will be installed to. These appeared as the third and fourth bootable devices to SeaBIOS. With my new SeaBIOS bootstrap, I now must hit “Esc” and “2” to boot off of the first USB stick for the Ubuntu installation. This presented me with the Ubunu boot menu. Beyond this point, I installed Ubuntu to the two external 1TB USB disks, with a primary boot partition (type “83”) on each for /boot as normal linux ext4, and a primary RAID partition (type “fd”) on each for the RAID1 mirror upon which I layered LVM with a volume group named “vg” and a “rootfs” and a “swapfs” logical volume. At the end, I installed the grub boot sector to /dev/sdb and /dev/sdc (the two external 1TB USB drives). After removing the USB stick for the Ubuntu installation media, the SeaBIOS entries shifted by 1. With my new SeaBIOS bootstrap, I now must hit “Esc” and “2” to boot off of the first USB 1TB drive, or “3” for the second USB 1TB drive. When I figure out how to get around the SeaBIOS hang on boot if I don’t do this, I will update this blog post. From this point forward, I followed the DevStack All-in-one single-machine install guide. As the stack user, running ./stack.sh kicked off the install, and it completed successfully. I also ended up creating this ~/.fog file locally on my Mac, based on CloudFoundry’s guide to validating your OpenStack. With it, I can now use the fog command-line tool locally on my development Mac to manipulate the ChromeBox based OpenStack server. A common devops problem when developing Docker containers is managing the orchestration of multiple containers in a development environment. My coreos-vagrant-kitchen-sink github project submits cloud-init units via a YAML file when booting member nodes. It’s a good model for production, but it’s a bit heavy for development. Docker is currently working on Docker Clustering, but it is presently just a proof-of-concept and is now under a total re-write. They are also implementing docker composition which provides Fig like functionality using upcoming docker “groups”. That influence of Fig makes sense, as Docker bought Orchard. Internally, Docker developers use Fig. Docker’s website also directs everyone to Boot2Docker, as that is the tool Docker developers use as their docker baseline environment. 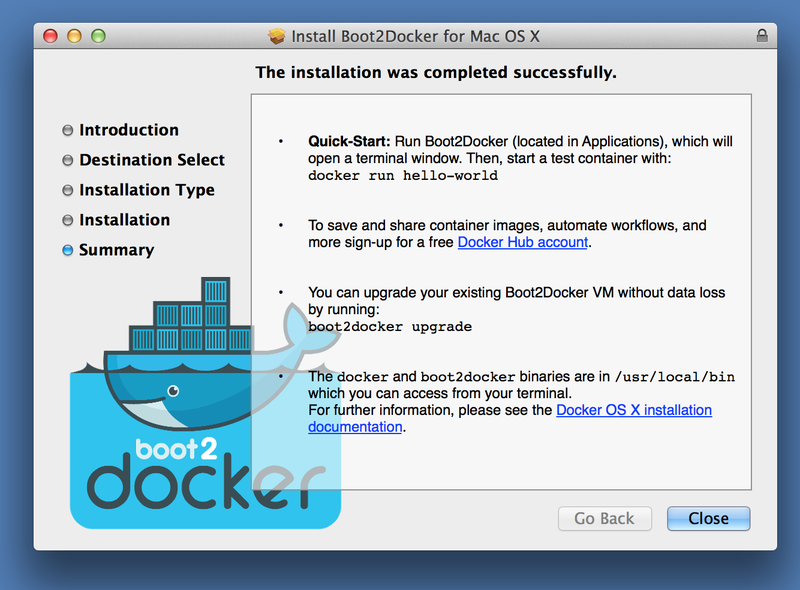 Boot2Docker spawns a VirtualBox based VM as well as a native docker client runtime on the developer’s host machine, and provides the DOCKER_HOST and related enviroments necessary for the client to talk to the VM. This allows a developer’s Windows or OS/X machine to have a docker command that behaves as if the docker containers are running natively on their host machine. While Fig is easy to install under OS/X as it has native Python support (“pip install fig”), installing Fig on a Windows developer workstation would normally require Python support be installed separately. Rather than do that, I’ve built a new ianblenke/fig-docker docker Hub image, which is auto-built from ianblenke/docker-fig-docker on github. Now the developer can run fig as if it is running on their development host, continuing the boot2docker illusion. In the above examples, the current directory $(pwd) is being mounted as /app inside the docker container. 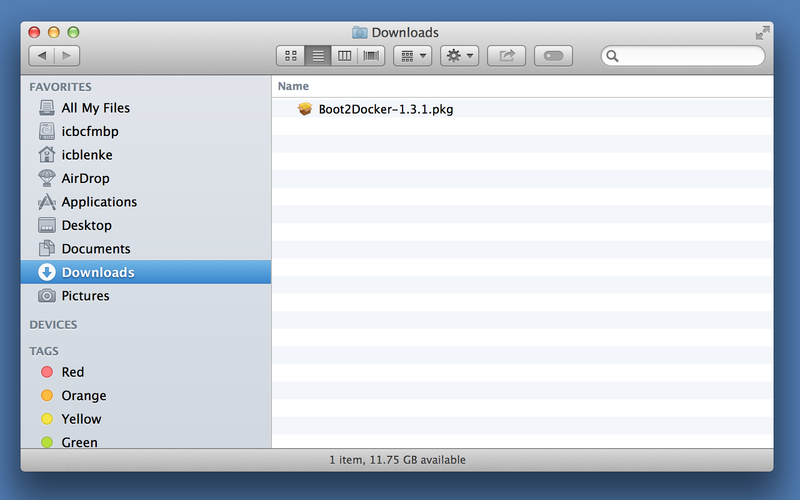 On a boot2docker install, the boot2docker VM is the actual source of that volume path. That means you would actually have to have the current path inside the boot2docker VM as well. From this point forward, until the next boot2docker init, your boot2docker VM should have your home directory mounted as /Users and the path should be the same. A similar trick happens for Windows hosts, providing the same path inside the boot2docker VM as a developer would use. This allows a normalized docker/fig interface for developers to begin their foray into docker orchestration. Let’s setup a very quick Ruby on Rails application from scratch, and then add a Dockerfile and fig.yml that spins up a mysql service for it to talk to. Here’s a quick script that does just that. The only requirement is a functional docker command able to spin up containers. After running that, there should now be a web server running on the boot2docker VM, which should generally be http://192.168.59.103:3000/ as that seems to be the common boot2docker default IP. This is fig, distilled to its essence. Beyond this point, a developer can “fig build ; fig up” and see the latest result of their work. This is something ideally added as a git post-commit hook or a iteration harness like Guard. While it may not appear pretty at first glance, realize that only cat, and sed were used on the host here (and very well could also themselves have also been avoided). No additional software was installed on the host, yet a rails app was created and deployed in docker containers, talking to a mysql server. And therein lies the elegance of dockerizing application deployment: simple, clean, repeatable units of software. Orchestrated. A common challenge for cloud orchestration is simulating or providing an S3 service layer, particularly for development environments. As Docker is meant for immutable infrastructure, this poses somewhat of a challenge for production deployments. Rather than tackle that subject here, we’ll revisit persistence on immutable infrastructure in a production capacity in a future blog post. The first challenge is identifying an S3 implementation to throw into a container. Rather than re-invent the wheel, it is possible to use deis-store directly. As Deis deploys on CoreOS, there is an understandable inherent dependency on etcd for service discovery. If you happen to be targeting CoreOS, you can simply point your etcd –peers option or ETCD_HOST environment variable at $COREOS_PRIVATE_IPV4 and skip this next step. Normally, we wouldn’t put the etcd persistence in a tmpfs for consistency reasons after a reboot, but for a development container: we love speed! Now that we have an etcd container running, we can spawn the deis-store daemon container that runs the ceph object-store daemon (OSD) module. It is probably a good idea to mount the /var/lib/deis/store volume for persistence, but this is a developer container, so we’ll forego that step. The ceph-osd will wait in a loop when starting until it can talk to ceph-mon, which is the next component provided by the deis-store monitor container. In order to prepare the etcd config tree for deis-store monitor, we must first set a key for this new deis-store-daemon component. While we could do that with a wget/curl PUT to the etcd client port (4001), using etcdctl makes things a bit easier. It is generally a good idea to match the version of the etcdctl client with the version of etcd you are using. This isn’t ideal, of course, as there is a slight delay as etcdctl is built and installed before we use it, but it serves the purpose. There are also deis/store-daemon settings of etcd keys that customize the behavior of ceph-osd a bit. Now we can start deis-store-monitor, which will use that key to spin up a ceph-mon that monitors this (and any other) ceph-osd instances likewise registered in the etcd configuration tree. As before, there are volumes that probably should be mounted for /etc/ceph and /var/lib/ceph/mon, but this is a development image, so we’ll skip that. There are also deis/store-monitor settings of etcd keys that customize the behavior of ceph-mon a bit. Now that ceph-mon is running, ceph-osd will continue starting up. We now have a single-node self-standing ceph storage platform, but no S3. The S3 functionality is provided by the ceph-radosgw component, which is provided by the deis-store-gateway container. There is no persistence in ceph-radosgw that warrant a volume mapping, so we can ignore that entirely regardless of environment. There are also deis/store-gateway settings of etcd keys that customize the behavior of ceph-radosgw a bit. Note that the host here isn’t the normal AWS gateway address, so you will need to specify things for your S3 client to access it correctly. Likewise, you may need to specify an URL scheme of “http”, as the above does not expose an HTTPS encrypted port. There are also S3 client changes that may be necessary depending on the “calling format” of the client libraries. You may need to changes things like paperclip to work with fog. There are numerous tools that work happily with ceph, like s3_to_ceph and even gems like fog-radosgw that try and help make this painless for your apps. I will update this blog post shortly with an example of a containerized s3 client to show how to prove your ceph radosgw is working. Preface: the boot2docker README is a great place to discover the below commands in more detail. Now the shell has those variables exported for the running boot2docker VM. After doing this, there is no longer a VM defined. We would need to go back to the boot2docker init step above and repeat. From this point forward, we use the docker command to interact with the boot2docker VM as if we are on a linux docker host. The docker command is just a compiled go application that makes RESTful calls to the docker daemon inside the linux VM. This holds true for both OS/X and Windows. The boot2docker facade is just a handy wrapper to prepare the guest linux host VM for the docker daemin and local docker command-line client for your development host OS environment. And now you have a starting point for exploring Docker! Starting with a new team of developers, it helps to document the bootstrapping steps to a development environment. Rather than try and use a convergence tool like Chef, Puppet, Ansible, or SALT, this time the environment will embrace Docker. We could use a tool like Vagrant, but we need to support both Windows and Mac development workstations, and Vagrant under Windows can be vexing. I’ll leave the commandline install of VirtualBox up to your imagination. With HomeBrew Cask, there’s really not much of a point. If you’re still not comfortable, below is a pictoral screenshot guide to installing boot2docker the point-and-click way. Run the downloaded Boot2Docker.pkg or docker-install.exe to kick off the installer. 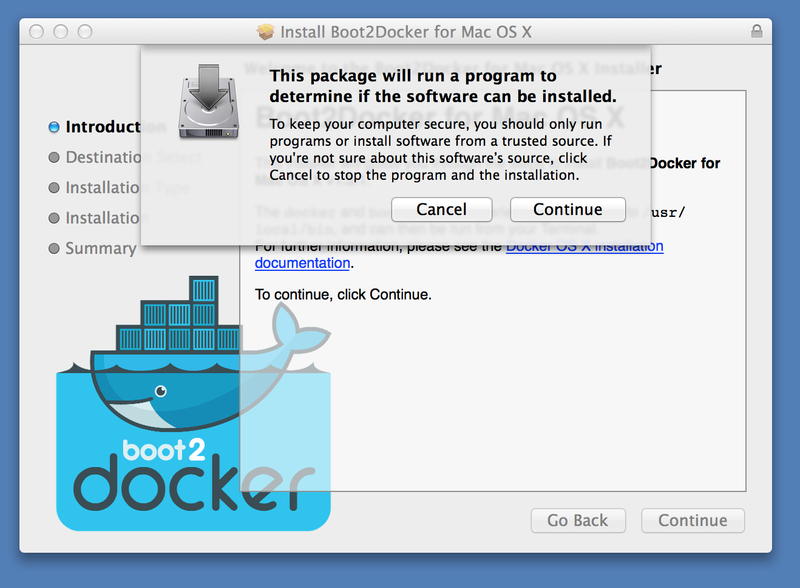 Click the Continue button to allow the installer to run a program to detect if boot2docker can be installed. Click the Continue button to proceed beyond the initial installation instructions dialog. 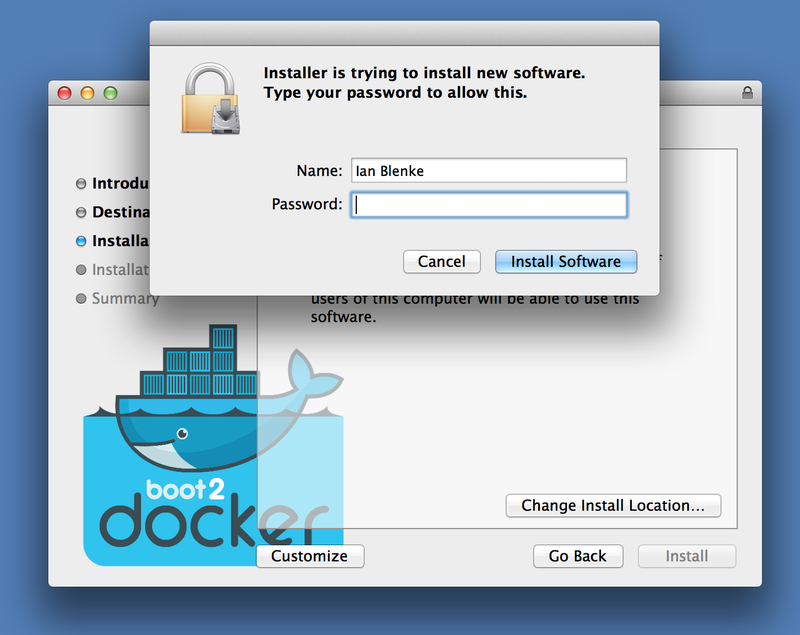 The installer will now ask for an admin username/password to obtain admin rights to install boot2docker. 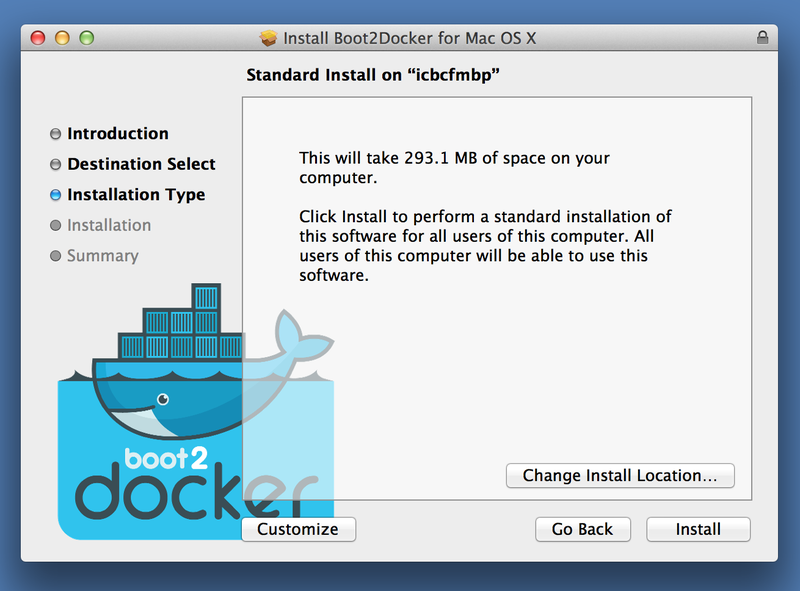 Before installing, the installer will advise how much space the install will take. Click the Install button to start the actual install. When the installation is successfully, click the Close button to exit the installer. 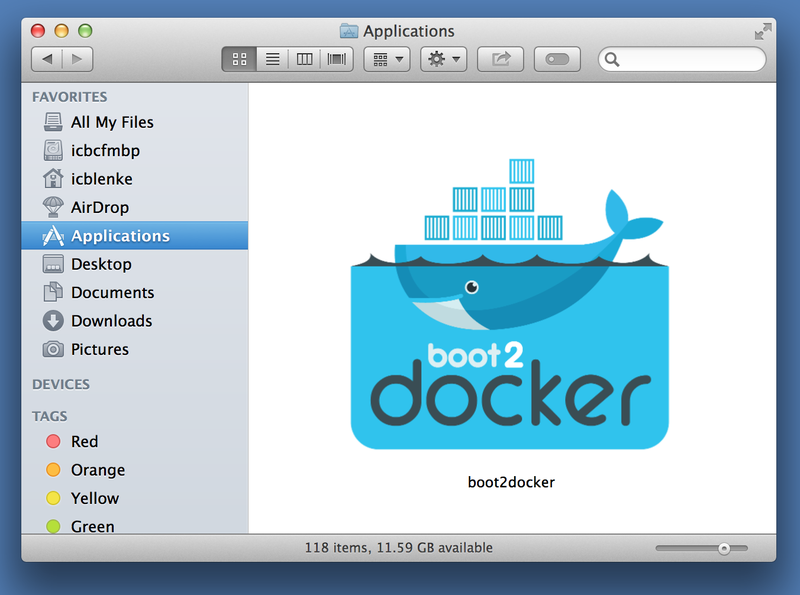 You now have a shiny icon for boot2docker in /Applications you can click on to start a boot2docker terminal window session. Congrats. 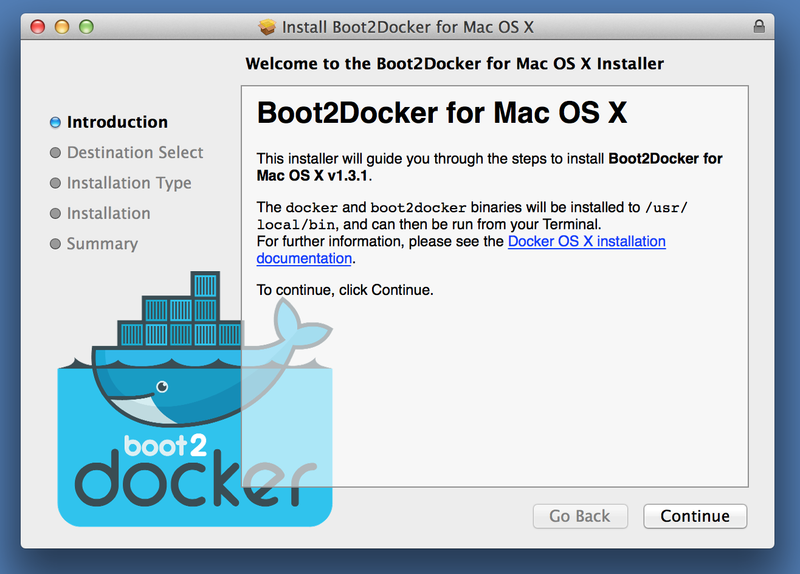 You now have boot2docker installed.